Based in Burntwood and Heath Hayes, I provide a wide range of hypnotherapy services covering Burntwood, Cannock, Heath Hayes, Brownhills, Hednesford, Rugeley & surrounding areas. Home visits are also available. Teaching Self Hypnosis - £60.00 per session (Through hypnotherapy: learn the art of being able to administer hypnotherapy yourself in order to help with anxiety, stress, relaxation, etc). Is this the right time for me to stop? Am I ready and willing to make positive changes in order to become a non-smoker? If you can readily and honestly answer a wholehearted YES to ALL of the above, then please contact 'Hypnosis 4 Progress for a confidential chat or to book an appointment. or get on touch using our friendly enquiry form. There are many ways to stop smoking, such as: chewing gum, inhalers, tablets, lozengers, drugs, nicotine patches, electronic cigarettes, etc. However, all of the above omit the most important element, which is the unconscious mind. This is where clinical hypnotherapy works at its best! Why not treat someone you care about to a unique and thoughtful gift that could possibly even change their outlook on life for the better? Because hypnotherapy is such a relaxing, calming and comforting experience for body and mind, you are now able to purchase gift vouchers for a Deep Hypnotherapy Relaxation experience. 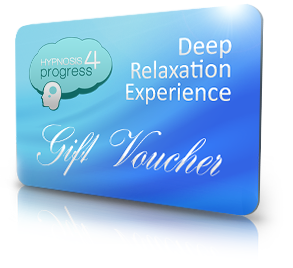 Hypnosis 4 Progress gift vouchers are valid for one person, for one Deep Relaxation session with a fully qualified and registered therapist. The gift vouchers are available for £60.00 and will be valid for 6 months from the purchase date. Vouchers may be used as part/full payments towards actual, clinical hypnotherapy sessions if preferred. General gift vouchers can also be purchased from as little as £20. These can be used towards any hypnotherapy session of choice. (Unfortunately, gift vouchers are not exchangeable for cash). To purchase a gift voucher please contact the clinic with your request. The recipient will then able to arrange their preferred session themselves and merely present the gift voucher at that session; prior to benefiting from a deeply, calming, wonderful, relaxing experience that they will never forget! (As with all hypnotherapy sessions, a free consultation will be included at the first meeting). Payment Terms: Payment is by way of cash at the time of treatment, or PayPal prior to treatment. Cancellations: 50% of the treatment charge will be due for all missed appointments / cancellations with less than 24 hrs notice.